Keegan Boos – (Beginners – 2010). Hey Keegan. Thanks for taking the time out to speak to me about your new film ‘Beginners’. What’s the general premise of the film? It’s the story of a father and son. The father (Christopher Plummer) comes out to his son as a gay man after the death of his wife of 45 years. He is in his 70’s and doesn’t have long to live because he’s also been diagnosed with cancer. This makes the son (Ewan McGregor) question his own life experiences and relationships. Mike Mills was casting for a child to play Ewan McGregor around the age of 10. This is when he’s beginning to realize that something may not be quite right with his parents relationship. 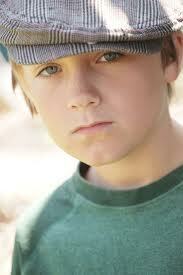 Young Oliver is kind of a quiet kid, especially considering his mother’s (Mary Page Keller) wacky personality. He doesn’t understand that she behaves this way because she’s unhappy. The film stars Ewan McGregor, Christopher Plummer and Melanie Laurent – what was it like working with the cast and crew on-set? All of my scenes take place in the past with Ewan’s mother played by Mary Page so I didn’t shoot any actual scenes with Ewan, Christopher or Melanie but they are all great people. Ewan is very funny and talkative – I really liked him a lot. He has a great personality. Christopher is also very funny and has a real zest for life and Melanie is so beautiful and really funny as well. Let’s talk a bit about you Keegan. What made you want to get into acting in the first place? My mom was a casting director so I always heard a lot of acting and actors at home and I love watching movies so one day I realized that I could try it myself. I booked a few of my first auditions and just kept going from there. It’s hard work going to all the auditions and memorizing all the lines because you definitely don’t get most of the parts you try out for, but it’s always worth it once you book a part and are on set shooting. You can’t do it for the money it has to be because you really love it and want to do it. What has been the most interesting piece of local / national news you’ve heard in the last month? I was really sad to hear that Amy Winehouse passed away. I loved her music and really think it’s very sad that she died at such a young age. You’ve had a number of different roles in a number of TV projects – who has been your favourite actor to work with so far and who has given the best advice to you? I’ve really liked everyone I’ve worked with so it’s hard to pick a favorite. I really liked Ewan but we couldn’t ever shoot any scenes together because I was playing him as a child. I liked working with Rachelle Lefevre and Martin Henderson on the TV pilot ‘Reconstruction’. My character was a mute and Martin talked to me about how important it is to actually listen to what the other actors in the scenes are saying. Rachelle told me that actors are never allowed to be sick or at least not to show it because I had a bad cold the whole time we were shooting. I also really liked Mark Pellegrino who played Jacob on ‘Lost’ – we had a couple of scenes together when I was playing Young Sawyer. I would say though that it’s the directors I’ve worked with who’ve really helped me learn the most about acting. Mike Mills is such an amazing person and I feel really connected to him. He’s taught me so much and I wish I could work with him all the time. What kind of roles would you like to pursue in the future? Well I’ve generally played a lot of quiet or sad roles so far but I’d really love to play a part with a lot of action. I know they are making a movie of my favorite book Ender’s Game and I would love a chance to play Ender Wiggin or any other role in that film. What’s coming up for you in 2011? Previous Nick Holmes – (Super – 2010). Next Mpho Koaho – (Falling Skies – 2011).